Starting a business in British Columbia (B.C.) and need to know about business registration? The basic registration procedure is the same, no matter where you live in Canada, but the details are different in each province and territory. This article will guide you through the steps you need to follow to get your new sole proprietorship, partnership or incorporated business legally set up in B.C. You also need to choose a name for your new business. The name you choose will depend on what form of business you've chosen to operate, as the registration rules are different for each form of business ownership. If, for example, you've chosen to set up your business as a sole proprietorship using your own name, without adding any other words, business registration in B.C. is not necessary. It usually takes about three working days for the name approval request to be processed. You can pay an additional fee (currently $100) for priority service which usually has a 24-hour turnaround. The results of the search can be checked online, mailed to you, or given to you over the phone if you’ve dealt with a local government agent. If one of the business names you submitted was approved, it will be reserved for you for 56 days. If you don't complete the registration procedure within that time, you'll have to start the process all over again with another Name Approval Request. Other than some basic information, such as name, address and the nature of your business, the form asks you to list three business name choices. If you are registering a sole proprietorship or partnership, your business name will consist of just the first two parts. The distinctive element is “a distinctive non-descriptive word or phrase, for example, a geographical location, your name, a made-up word or phrase, initials” (BC Corporate Registry). The descriptive element is the part of the business name that usually describes the nature or type of business. The corporate designation is composed of those words that state a company’s legal structure, such as Limited, Incorporated, or Corporation. Using the abbreviations for these words is allowed. So if I choose the business name Qualicum Beach Antiques, “Qualicum Beach” is the distinctive element of the name while “Antiques” is the descriptive element. If I was planning to incorporate this business when I registered it, I might choose a name such as Qualicum Beach Antiques Ltd., including a corporate designation in my business name. For more about business name elements and the types of names you are allowed to create for each form of business, see the instructions section of the Name Approval Request Form. Be sure you do choose three possible names. If you just list one, and it’s taken already, you’ve basically thrown your fee away. Also be sure to list your business name choices in order of preference. When your Name Approval Request Form is processed, the Ministry will only search until a choice is approved, or all are rejected. So only your first choice will be searched if that name is available. Even if your name request is successful, the Corporate Registry advises you not to spend any money advertising, getting new business cards printed or otherwise investing in your new name, as the name is only reserved. Save your money until your business name registration in B.C. is completed. It would be really painful to spend money advertising a name that someone else ended up using, wouldn’t it? In the same vein, you should note that the names of sole proprietorships and partnerships have no statutory name protection; only the names of corporations are protected. You may also file the completed registration form at your local government agent’s office or mail it to the Ministry of Finance, (the address is on the Registration Form). Depending on whether you are registering a sole proprietorship or partnership, you must fill out a Statement of Registration Sole Proprietorship or your Statement of Registration General Partnership and submit your declaration and fee (currently $40). Note, however, that this fee applies only to a general partnership; the basic fee for registering a limited partnership is currently $165 (plus the $30 name approval fee). a “real” address in B.C. (not just a general delivery, rural route or post office box). B.C. incorporation is a longer and costlier process and not available through OneStop Business Registration. Instead, incorporation applications can be filed online via Corporate Online. The Incorporation Agreement basically outlines the ownership of the corporation. It specifies who the incorporators (shareholders) are and the number of shares of each class that each shareholder will hold (see How Do I Set Up Share Classes for My New Corporation?). The company’s Articles of Incorporation set out the rules for the conduct of the company. View an example of Table 1 Articles that you may choose to adapt to form your BC corporation (BC Registration Services: Corporate Online). You can think of the Incorporation Application as the actual corporation registration form. The incorporation registration process can be completed online or by mail. To incorporate online, go to Corporate Online. If you prefer to file by mail, Dye & Durham (1-800-665-6211) can file for you. You will need to send them a complete, signed copy of the Incorporation Application (and a cheque). Whether you are filing online or not, the Corporate Registry recommends that you work through the paper version of the B.C. Incorporation Application. Filing the Incorporation Application using Corporate Online or Dye & Durham costs $388.68 currently. Note that although these are all the documents you need for incorporation registration, you will have to file other documents related to the corporation now that your corporation is up and running. See What to Do Once You Get Your Certificate of Incorporation for more details. To federally incorporate your business you must file Articles of Incorporation with Corporations Canada. 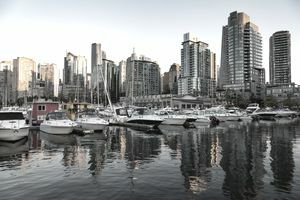 Corporations Canada administers the CBCA (Canada Business Corporations Act), and the office with which all filings related to corporations are made; there are offices in Vancouver, Ottawa, Montreal, and Toronto. The cooperative is another choice when you’re choosing a form of business. Cooperatives operate differently from other businesses in that they are run democratically on the principle of "one member equals one vote". Members share ownership and decision making. Under the Cooperative Association Act, cooperatives must be registered or incorporated, and the procedure is very similar to that outlined for non-cooperative businesses. If you want to set up a cooperative, see the Guide to Incorporating a Cooperative Association in British Columbia. The document includes forms that you will need to file as part of the incorporation process. The current fee for incorporating a cooperative is $250. No matter which form of business you choose, it’s wise to seek the advice of professionals who have more experience setting up businesses. Besides consulting a lawyer or notary public, you may also wish to discuss your situation with an accountant, who will be able to advise you on the best form of business ownership for you. How Much Business Name Protection Do You Have? In Canada, Can Two Businesses Operate With the Same Name?